Cagliari is a very lively and dynamic city, very open to the world, with a unique climate. Often, those who visit it, even if briefly, return to put down roots and do not leave anymore. It is the main port of Sardinia and with about 220,000 inhabitants is the symbol of the entire region. It lies on the southern coast of the island, in the most central part of the gulf, also known as "Gulf of Angels". Cagliari is a young and cheerful city with an excellent quality of life: the city is stretched in length and combines the old with the new, the past with modern folklore to the latest fashion trends. Along a maze of avenues, narrow and sometimes exhausting streets, you will get to admire a very nice and reassuring panorama: the sky is red at sunset and Art Nouveau villas in the neighbourhood of Merello Avenue give way to the sea and the lagoon towards the mountains of the nature reserve of Monte Arcosu. 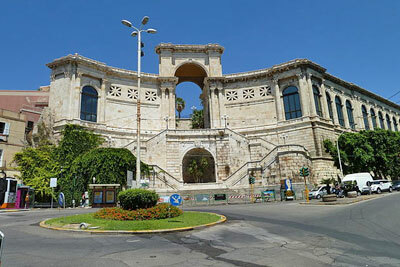 Read more about the city in this Cagliari itinerary. Cagliari (city map) is a beautiful city blessed with friendly nature with a very ancient history dating back to prehistoric times. What appears today is the result of traditions, customs and architecture that developed over time. The city was probably founded by the Phoenicians, who built a first settlement in the current area known as Santa Gilla, and here the archaeological excavations have unearthed the oldest evidence of the history of Cagliari. The favourable location of the island and Cagliari, the main outpost facing the major ports of Sicily and Africa, promoted trade on the sea and the consequent conquest of the Romans in the third century BC. Cagliari is for many the beginning of the discovery of Sardinia, but not only that. The city is able to satisfy the most diverse interests of those who decided to visit it. Just rent your car in Cagliari airport and start the journey. Sardinia is of course synonymous with crystal-clear sea and in Cagliari you can find one of the most beautiful and longest beaches in the Mediterranean, the Poetto’s Beach. There are also many lagoons and unspoilt nature reserves, unique in Europe. Molentargius, for example, is renowned for its pond rich in birds, especially flamingos. Located close to the city and the coastline, the pond has both fresh and brackish waters and divides the long beach from the town of Quartu Sant’Elena, now become almost a fraction of the largest city. The flamingos with the delicate pink plumage dive head in search of food and on some days the water will change colour to become pink and red. On the other side of town, another pond is that of Santa Gilla, interdependent with the first and connected to other areas of the lagoon area. 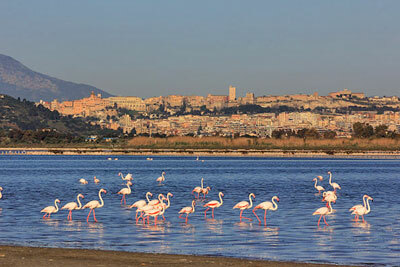 No need to go to the French Camargue to attend one of the greatest spectacles of nature, because this is Cagliari. For lovers of culture and history, Cagliari offers many museums and monuments along with several exhibition spaces, musical and festivals all seasons of the year.